Next month, St John Sessions will be presenting the second installment of their 2015 programme in collaboration with Denovali Festival London. The legendary composer and his ensemble will headline the evening for a rare performance of Hassell's landmark live work 'Psychogeography'. The night is set to be an escape from reality: in a feature on Hassell on tQ last year, Daniel Patrick Quinn described his albums as "fantasy lands", adding that "it's a environment in which the intellectual and the sensual have fused, in which cutting edge technology and primal urges have come together in balance. This place must be located somewhere on the equatorial beltline – the point at which Hassell's 'north' and 'south' meet. It is, perhaps, a highly optimistic painting or dream of what the Earth could be like, a century or two from now." Support comes from Fennesz, who will return to perform after playing at the very first St John Session in June 2013. The Editions Mego artist released his album Bécs last year, which Tristan Bath called: "no grand departure, but its a refinement, and potentially even the man's masterpiece, traversing the Alpine mountainous gap from utter anarchic noise to utter tranquility without batting an eyelid." 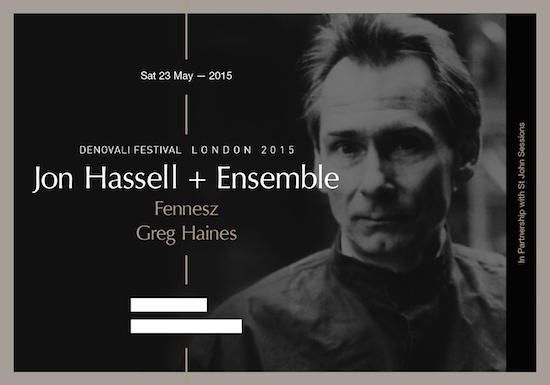 Denovali's Greg Haines and a live audiovisual performance from Moon Zero will complete the extended billing. The above lineup will play St John in Hackney on Saturday 23 May 2015. Tickets can be purchased here.